James Pierce’s Iron Banking Building as it currently exists in c. 2013. Sharpsville, PA. There was a lot of trust in the hearts of small-town citizens in the 1950s. In fact, I don’t remember if we even thought much about it. Trust was something that was taken for granted when doors were left unlocked overnight or we children ran about the neighborhood unsupervised. In those days, there were no such things as identity theft, car alarms or security cameras. 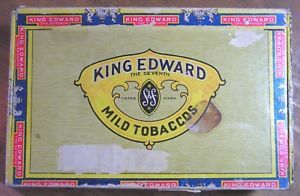 “King Edward Mild Tobaccos” Cigar Box, a handy container for many things. An example of this was my father’s instinctive trust, not only in us kids but in small-town society in general, when he sent us to the bank each week to deposit cash and checks from his printing business. I can still picture my brother or myself, about 9 and 11 years old, carrying that yellow King Edward cigar box weighed down with rolls of coins and checks as we walked along the dirt path that ran between our Second Street house and the Erie Railroad tracks. When we reached North Walnut Street we would leave the path to turn left, cross the tracks, then take a right on East Shenango Street. After another block or two, we reached a row of buildings that included the three-story First National Bank on the corner of North Mercer and East Shenango streets, less than a half-mile from our home. There, barely able to reach the teller’s window, we would slide the contents of the box under the teller’s cage, the teller would tally the items in a little bank book, date-stamp and initial the entries and return the book to us. There was a bit of irony in those regular deposits that were earned by my father’s business. In earlier years, Dad was turned down by a bank’s employee when he asked for a loan to start up his printing business. Now that Dad’s business was doing well, each deposit must have been very satisfying to him. Iron Banking Company, c. early 1900s. First National Bank of Sharpsville, c. 1930s. PNC Bank, c. early 2010s. The Iron Banking Company building, built in 1871 by General James Pierce. Corner of Mercer and Shenango Streets, Sharpsville, PA.
As children, we weren’t aware that the bank building we visited, like the Pierce Mansion we passed along the way (before its demolition in 1952), was already four decades old and part of the James Pierce legacy. The structure was constructed in 1871 by “General” James Pierce (1810-1874), president and principal owner of Sharpsville’s first bank, the Iron Banking Company. It was built to resemble the Italianate style of architecture popular nationwide in the mid- to late-1800s, with its rectangular shape and its row of seven tall front windows that were rounded on top. The Geddes & Pierce Foundry supplied the cast iron front of the building. James Pierce’s presidency was followed by that of his son Frank (1852-1931). The Iron Banking Company was later converted to the First National Bank of Sharpsville in c. 1905. In 1964 it became a branch of the McDowell National Bank in Sharon. Later, the building housed other banking institutions, including a PNC branch until 2013. As of 2015, the first floor was occupied by Meadville Area ONE Federal Credit Union. The two brick buildings on North Mercer Avenue are now part of the Sharpsville Borough Historic District. It was the era when banks sponsored Christmas Clubs. People — especially youth — were encouraged to deposit small amounts of money each week for 50 weeks. Banks solicited five cents or 10, 25 or 50 cents to do the double job of teaching people to save money and promoting Christmas sales for merchants. The banks would issue a passbook in which a teller would record the weekly deposits and then initial the entry. Two weeks before Christmas, one could withdraw the savings in cash (without interest) for a shopping spree. For several years I managed to join the 10 cents club and was awarded the joy of a cash harvest of $5 at Christmas time. Even though the interest rate was low or nonexistent and fees were charged for withdrawals, I had a feeling of accomplishment when I received that check in early December. And the Christmas Club may have contributed to the way we siblings handled our finances since then, leaning more toward careful than spendthrift. The Club exists to this day, although primarily run by credit unions. 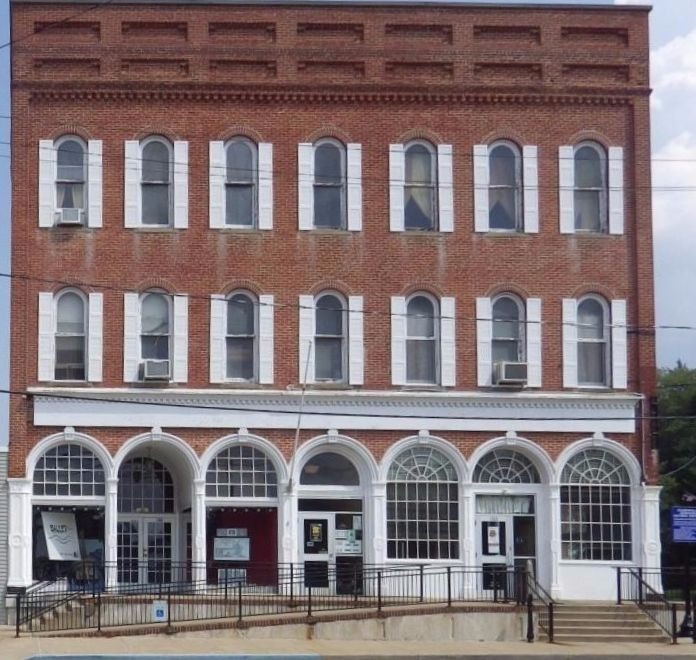 For 40 years after Pierce’s bank building was constructed the 3,000-square-foot third floor served as Sharpsville’s cultural center, having been home to the Pierce Opera House. There is limited information about the shows performed in those early days, but it is known that the organization offered a variety of musical events and featured speakers. Once motion pictures became popular, they were shown as well. In addition, the two upper floors were used for high school graduations during the late 1800s until c. 1920, an occasional basketball game in the early 1900s and as a meeting place for the Order of the Eastern Star and the Masons. The building also housed the original offices of the town’s early newspaper, “The Sharpsville Advertiser,” started by Walter Pierce, James Pierce’s son. After the 1920s this floor remained unused for some time. Wanting to see the restoration continue in good hands, Mr. Wilson sold the building to Dr. Francisco Cano, an allergist/immunologist from Greenville, PA, himself professionally trained in operatic voice. Cano’s love of opera and the arts was a driving force behind the ongoing phases of restoration designed to house theatrical, musical, and opera performances once again. The first performance of the Pierce Opera House’s revival was in 2009. The Pierce Opera House itself is worth the visit. This historic venue features beautifully restored woodwork, excellent acoustics, and a warm intimacy between the audience and the stage. Modern climate control and conveniences have been introduced to this 142-year-old local treasure. The Valley Lyric Opera, which now resides in the Pierce Opera House, provides an excellent level and variety of programs. Past performances include the operas Aida, La Traviata, La Boheme, Rigoletto; musicals [performed by the Area Community Theatre of Sharpsville — ACTS] South Pacific, Man of La Mancha, as well as ballets, musical tributes to Neil Simon and Andrew Lloyd Webber and a host of other outstanding offerings. Angel, August D. Trivia & me: an octogenarian mirrors his twentieth century. London, KY: August David Angel, 2007. Print. “Bravo! Sharpsville steps into act with opera performances in July.” 22 March 2009. http://www.vindy.com/news/2009/mar/22/bravo-sharpsville-steps-into-act-with-opera/ [accessed 31-Oct-2017]. Internet resource. “Christmas Club.” Wikipedia website. en.wikipedia.org/wiki/Christmas_club [accessed 31-Oct-2017]. Internet resource. Hanes, Gail Nitch, Sharpsville: Our Home Town — Then and Now.” 2012. Pp. 13-18 and 57-59. Powerpoint on PDF. Internet resource. “More About Rigoletto.” Sharpsville Area Historical Society Newsletter, July 2013, Vol. II, No., 2, page 2. Pierce Opera House website. www.valleylyricopera.org [accessed 23-Oct-2017]. Internet resource. “Walking Tour.” Sharpsville Area Historical Society. walkingtour.pdf [accessed 23-Oct-2017]. Internet resource. Sharpsville Area Historical Society’s Newsletter, March 2017 issue, page 2, for more about the Opera House Block. Another great article. Every one brings back good memories. Keep them coming. Stay young Ann, as long as you do they will keep rolling in.